Is Immigration Good for the U.S. Economy? An article and New England-wide public radio story, produced by New England News Collaborative, featuring many charts and maps from DataHaven. View the full story and listen to interviews at https://nenc.news/is-immigration-good-for-the-us-economy/. "One of the biggest political arguments against immigration is that it hurts the chances of American-born workers to succeed and damages the U.S. economy. But in New England, where the population is rapidly aging and the young replacement workers needed to sustain the workforce are leaving, immigration just might be the answer. On this special segment of NEXT, we speak with experts about how immigration is affecting the local and national economy through data, statistics, and the human stories behind them. We speak with Ahmed Mushfiq Mobarak, Professor of Economics at Yale University, Shannon Dooling, a reporter for the NENC and WBUR, Will Kneerim, the Director of Employment and Education Services at IRIS." New England is home to 1,859,602 immigrants, making up 13 percent of the region’s population. Much larger shares of the populations in southern New England states are foreign-born than in the northern states. Immigrants are concentrated most heavily in counties in Southern New England. 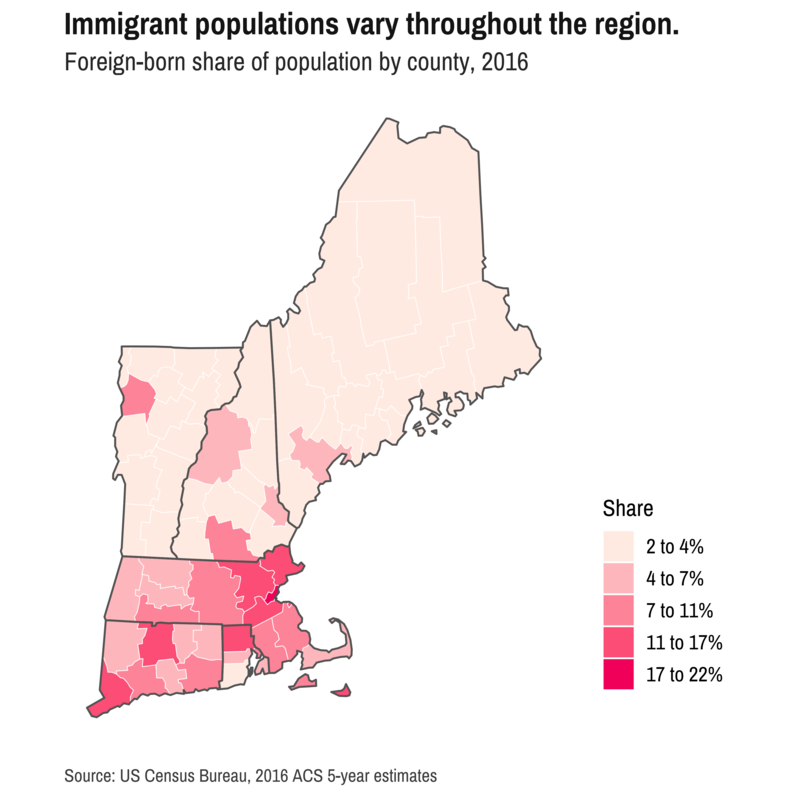 Most counties in Maine, New Hampshire, and Vermont are less than 10 percent foreign-born, whereas Fairfield County, Connecticut and Suffolk County, Massachusetts are 17 and 22 percent foreign-born, respectively. 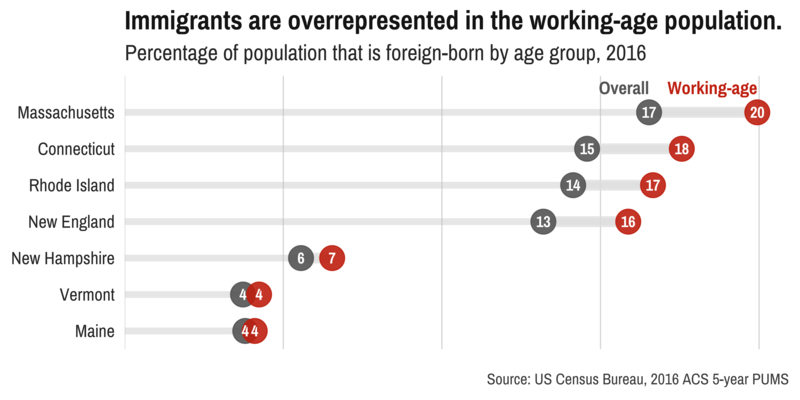 In New England, immigration may affect the economy differently, bringing in working-age people in a population that is rapidly aging. Larger shares of New England’s working-age population are foreign-born than its overall population. More than 1.5 million immigrants in New England are between the ages of 16 and 64, making it 16 percent of this age group. Immigrants work in all industries throughout New England. In some of the region’s largest industries, such as accommodations and food service, manufacturing, healthcare, and social assistance immigrants make up larger shares of those industries’ employees than their share of the overall working-age population. New England’s immigrant populations come from every region of the world. In many cases, groups of immigrants from one region have settled into clusters in neighboring New England counties. About two-thirds of New England’s foreign-born population were born in just 19 countries, mostly in Latin America, the Caribbean, and Asia. 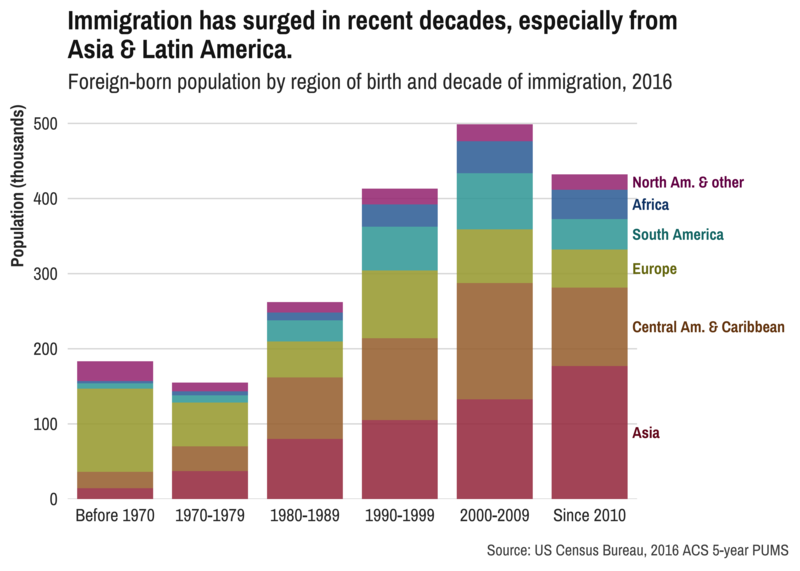 Immigration has surged in recent decades, especially from Asia and Latin America. Many of New England’s immigrants entered the U.S. relatively recently. 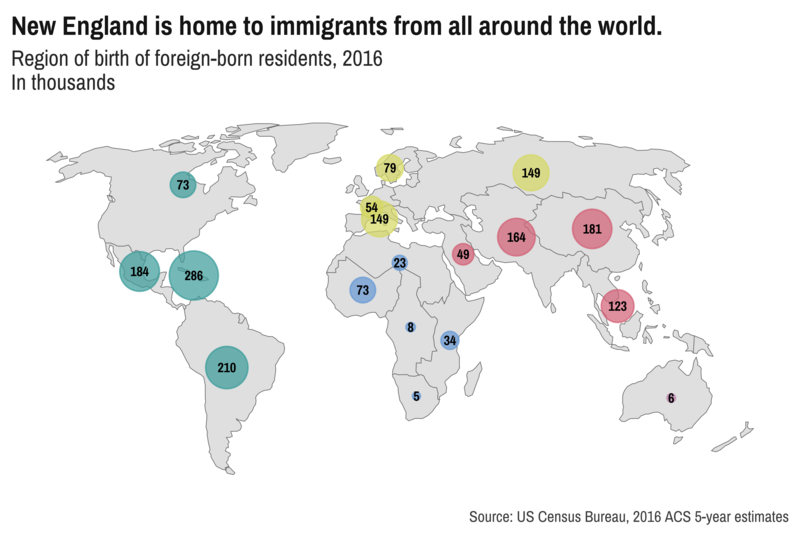 Nearly half the region’s foreign-born residents moved to the U.S. between 2000 and 2016, and the majority of these new Americans were born in Asia, Central America (including Mexico), or the Caribbean. In contrast, previous generations of immigrants came largely from Europe. 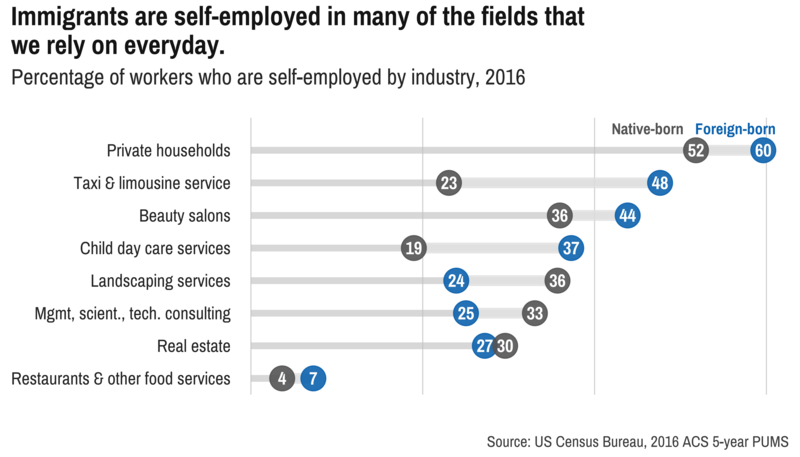 Immigrants are self-employed in many of the fields that we rely on every day. 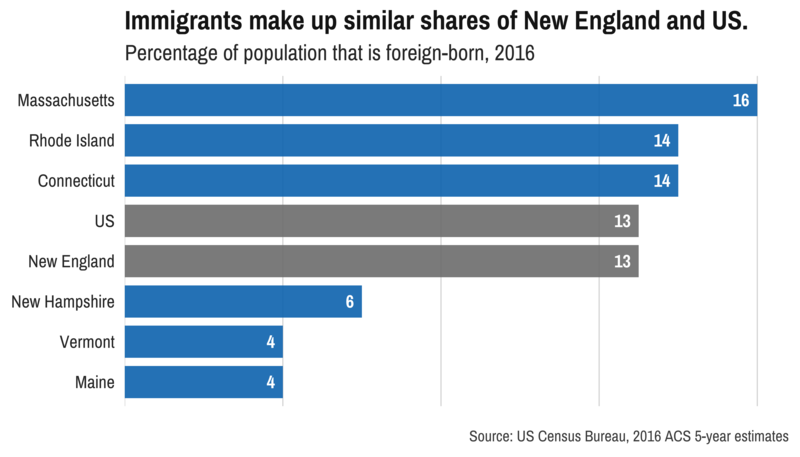 New England’s foreign-born residents are slightly more likely to be self-employed than New Englanders born in the U.S.: 121,886 immigrants are self-employed, making up 10 percent of employed adult immigrants. Large shares of working immigrants are self-employed in industries such as real estate and construction, and many own businesses in common service fields, such as child care, salons, and taxi services.